I was all about My Little Pony growing up in the 80's. My ponies are long gone, but my love was recently rekindled for them when I stumbled on four G1 ponies at the thrift store. I was so excited, that I cleaned them all up, researched reconditioning their hair, and got them all set that same day. They turned out beautiful. Since then, I can't stop thinking about ponies and keep researching and all the memories keep coming back. I'm in love and want to hunt down all the ponies I had from childhood. I'm super excited for Christmas. My sister-in-law has a vintage toy store on Etsy and is gifting me 14 ponies she found during her vintage toy hunts. This is going to be so much fun. !! Wow sounds like an exciting (re)start! 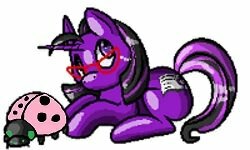 You should show off your new ponies in the Show and Tell board! Welcome to the forums. Hello, welcome, Im an 80s g1 mlp collector too, hope you enjoy the forums, lots of things to do. Howdy and how are ya? I'm so glad you joined and am enjoying reading your posts about cleaning your new Ponies. I'm so far behind on ponies, the forum and my life I will need to work work work for a few weeks! Hey! I love your Gusty by the way!